Leger and National released its annual report ranking Canada’s most admired companies. While some results were indeed surprising, others were not. Both Google and (Loblaw’s) Shoppers Drug Mart ended up at the top of their rankings as most respected companies, regardless of where the company resides. Google has been number one for six years now. It was surprising to see that Kellogg’s, in 8th place, is the most respected food company in Canada. Campbell’s and Kraft, two other food companies, closed out the top 10. Despite bread price collusion accusations, Sobeys went up 10 places, and remained the most admired grocer, while Subway was recognized in the food service category. Other food companies were on the move in the annual ranking. Heinz, affected by the closing of the Leamington plant and subsequent ketchup wars a few years ago, rose from 23rd to 13th place. All other companies in the food sector either remained static or dropped. Retailers Costco and Loblaw barely moved this year, while General Mills, McCain Foods, and McDonald’s all fell in rankings. But Tim Hortons’ year was just plain awful. It went from number 4 to number 50, in just twelve months. 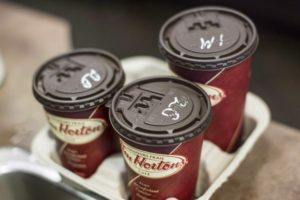 This significant freefall can be linked to the very public spat between Tim Hortons franchisees and the Tim Hortons parent company, Restaurant Brands International (RBI). This dispute has taken its toll and likely affected the reputation of the iconic Canadian company. RBI has been at war with Tim Hortons franchisees since 2014, when the holding company was created, and things have gotten progressively worse. While franchise owners — family businesses really — were committed to serving communities, RBI swooped in with an efficiency-driven agenda. Menu changes, royalty structure modifications, higher costs of supplies to operate outlets — all were revised to serve RBI’s shareholders, and it paid off. The share price hit a record high in October 2017, at $85. RBI’s ultimate commitment has been to its shareholders, and not necessarily to the Canadian public. This year’s Leger-National rankings confirm that Canadians have been keeping tabs. But RBI’s profit-driven agenda has started to work against it this past year. The $15-an-hour minimum wage campaign made Tim Hortons a public target right across the country. To make matters worse, memos were leaked suggesting that, in Ontario, where the minimum wage increased by 22% on January 1st, 2018, some Tim Hortons employees had been asked to pay for uniforms and cut out breaks. While other food chains were adapting well, the rift between RBI and its franchise owners in Ontario became even more evident to the Canadian public. Interestingly, however, even though RBI’s strategy has been all about profitability for the holding company, its share price has taken a hit since its peak in October 2017. Sales are slumping, and as a result, RBI’s shares values have fallen to nearly $70, and could drop even further. RBI’s response is to invest $700 million over the next four years, in changing the interior design all of its Tim Hortons restaurants. But here’s the catch: most franchise owners will be required to pay over $450k per outlet to support the cost of renovation and create a more open-seating concept. Given that the average Tim Hortons franchisee owns three outlets, the cost to support RBI’s new redesign strategy will be well over $1 million for a typical franchise owner. Basically, with this new strategy, RBI’s message to franchisees is quite simple: pay up or leave. RBI’s intent is clearly to renew its portfolio of franchisees and deal with operators who are more inclined to buy into the parent company’s philosophy. Not a great move on their part, if reputation is a metric they care about as a company. The Leger-National survey looks at perceived financial stability, corporate social responsibility, honesty, transparency, quality, and innovation. It may not measure how nationalistic ideals affect Canadians’ perception of companies at home, but this factor clearly skews ranking results. In Tim Hortons’ case, the brand itself is inherently linked to our perception of how it honours Canadian values. Canadian Tire, as an example, remained third in the survey, arguably because the brand itself is so entrenched with how respondents perceive their own country. It’s as simple as that. So, what the recent reputational survey is really telling us is that Tim Hortons is no longer seen as a Canadian company. Things are different now, and Canadians can feel it. Franchisees have known for a while that RBI’s game is disconnected from Canadian beliefs and that the company is distanced from Canada and from the restaurant business. Most RBI executives are not Canadian, and most employees at head office have never owned, managed or even worked at a restaurant, let alone at a food service facility in Canada. Since the RBI takeover, the traditional uniforms, the successful Roll up the Rim to Win campaign, the welcoming friendly smiles — all have been just a façade. They hid the troubling truth about the Tim Hortons conversion. The recent Leger-National survey confirms that Tim Hortons transformation into a foreign company is now complete. RBI, which also owns Burger King and Popeye’s, has its head office is in Oakville, where Tim Hortons’ main operations used to be located. Rumours suggest RBI will move to the States, to take advantage of a more fiscal-friendly environment created by new reforms there. It can be expected that most Canadians will not care much once Tim Hortons makes the move south of the border. In their hearts, Tim Hortons is already a foreign company, a switch-over that is likely what RBI wants. The brand will eventually survive, but things will never be the same.